One video shows Dalit women taking off sandals to walk past the "big people's houses"
Mumbai: One video shows police beating protesters with sticks. Another shows two lifeless, dirty bodies dragged from their workplace in the sewers. In a third, a man explains why his hand was slashed. The disturbing clips and personal stories have a common thread: all the victims are "untouchables", now known as Dalits, who are at the bottom of India's rigid Hindu caste hierarchy. The Dalit with the cut hand says he was harmed for drinking from a pot meant for higher castes, while filthy and dangerous sewer work is a profession reserved for families of the lowest caste. Such everyday discrimination is nothing new, but it is rarely documented with such intimacy and insider knowledge in India's mainstream domestic news media. "The mainstream media just report on the superficial events but they don't have depth," said Amol Lalzare, a Dalit and one of the "community correspondents" working for Video Volunteers, a media and human rights group. 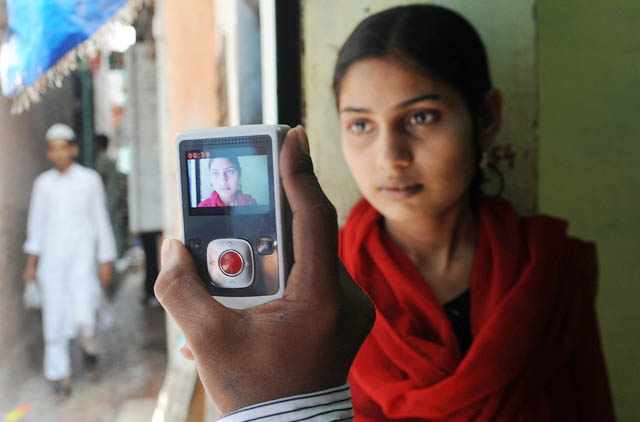 "I stay here, I know what's going on, and I also want to give solutions through my news clips," added Lalzare, who makes videos in the Mumbai slums with a camera not much larger than a mobile phone. The 27-year-old documents a range of issues affecting the poor, from water shortages and poor sanitation to corruption and sexual harassment in the slums, where more than half of the city's residents live. In their recently-launched campaign against caste discrimination, including a petition to properly end the illegal practice, Video Volunteers from across India have released footage to show the problem is still entrenched. They captured Dalit women who take their sandals off to walk past the "big people's houses", a barber admitting Dalits don't come to his shop, and a school where Dalit children eat separately. "It makes me nothing but angry," vented one female interviewee. Kumar Ketkar, editor of the Dainik Divya Marathi newspaper in Mumbai, agreed that marginalised communities rarely draw attention from mainstream news outlets. "Their normal everyday life does not get adequate coverage," he said, blaming the problem on the media's need for revenues from advertisers, who target a middle-class audience with "consumer potential". Lalzare and his colleagues earn 1,500 rupees (29 dollars) for each report and 5,000 rupees ($95) for an "impact" video, showing some kind of change as a result of their work. They number about 60 nationwide and contribute to the Video Volunteers' "IndiaUnheard" news service, which since 2010 has published regular clips online and sometimes at screenings for the communities concerned. In a major breakthrough for the group, one of the biggest English-language news networks in India, CNN-IBN, recently agreed to broadcast one of their stories per week to its millions of viewers. Topics broadcast so far include gender inequality in farm workers' wages and child marriage - one interviewee was a 12-year-old cattle grazer married off three years earlier. The project was set up to focus on "specific places where the media wasn't functioning," said American founder Jessica Mayberry, who is based in the southwestern holiday state of Goa. She said the problem was more extreme in rural communities, giving the example of eastern Jharkhand state, home to a largely tribal population but without a single journalist of tribal origin in the regular press. "It's a question of representation. Seventy percent of this country, the poor, is coming through this filter of the outsider who doesn't live there," she told AFP. The income for Video Volunteers is currently about two-thirds donations - from social entrepreneurship foundations and individuals - and one third revenue from selling content and training. The service is among various projects that have sprung up in recent years harnessing technology to give a voice to hundreds of millions of marginalised Indians who feel ignored by the media and the political class. Bangalore-based website www.ipaidabribe.com offers a place for users to vent their anger and share experiences of corruption across the country, where bribes and kickbacks are routine. P. N. Vasanti, director of the Centre for Media Studies in New Delhi, said the mainstream news channels were still dominated by politics, crime, sport and entertainment, but she thought social issues were gradually gaining ground. "It's an evolution of news media and evolution of the audience. They are learning to demand what they want," she told AFP.